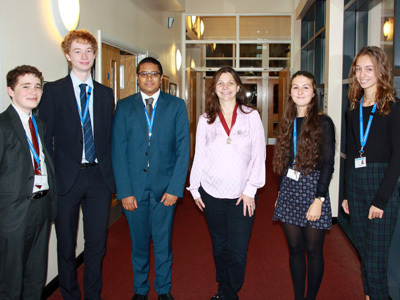 Harrogate Grammar School Alumnus Amanda Boag (1984 -1991) returned to talk to enthusiastic Years 11, 12 and 13 students about a career in Veterinary science and the life sciences. Amanda left Harrogate Grammar School in 1991 and trained as a vet at the University of Cambridge. Since then she has focused on being a small animal (dog and cat) specialist and in Emergency and Critical Care. The first half of her career was spent at one of the top vet schools in the country, the Royal Veterinary College, and for the last sixteen years she has been Clinical Director at one the UK’s entrepreneurial vet businesses, Vets Now. She was elected on to the council of the Royal College of Veterinary Surgeons (RCVS) in 2012 and recently became President.